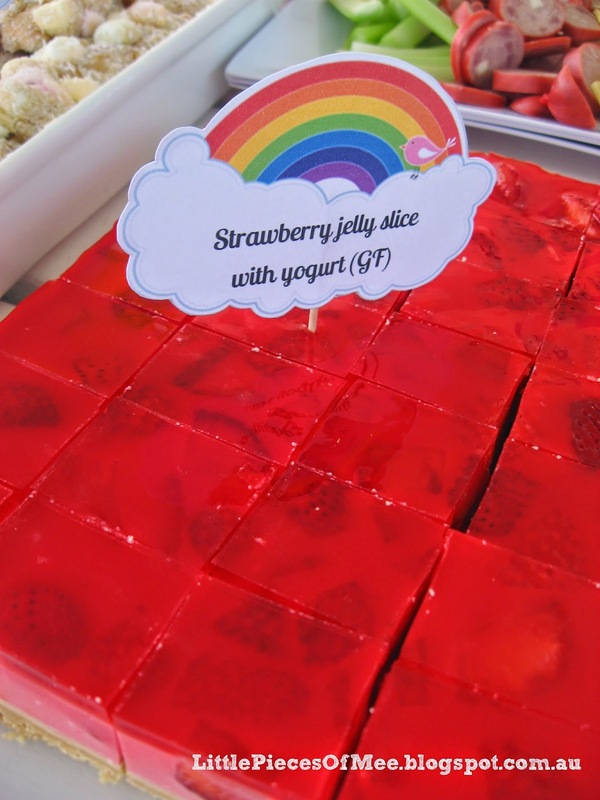 The second birthday party in our family's party season is for our younger daughter who turned 4 in May. 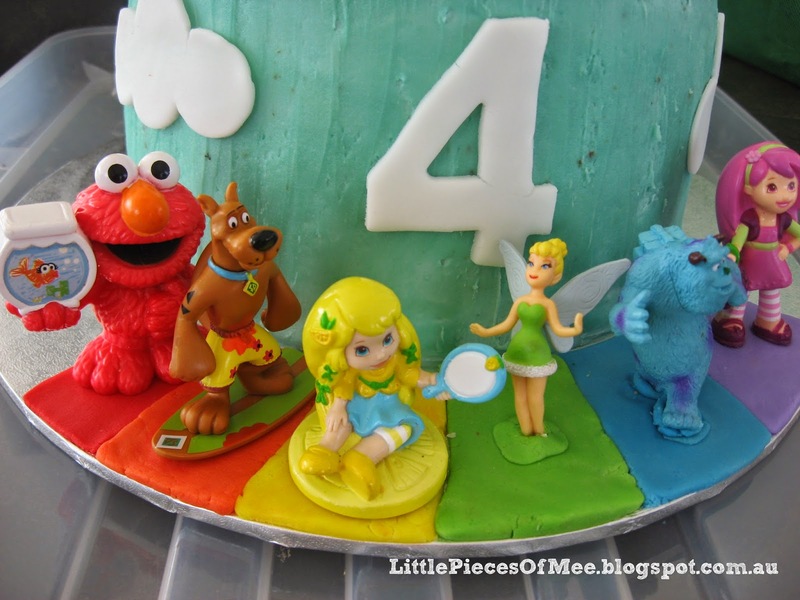 For months she had been talking about what theme she would like for her birthday, and she alternated between Scooby Doo, Sully from Monsters Inc, and Raspberry Torte (from Strawberry Shortcake). As her birthday approached, I was racking my brain to figure out a way to incorporate three very different characters into a single party theme. Then I remembered that last year I had wanted to do a rainbow party for her but she wanted Tad the Leap Frog frog. 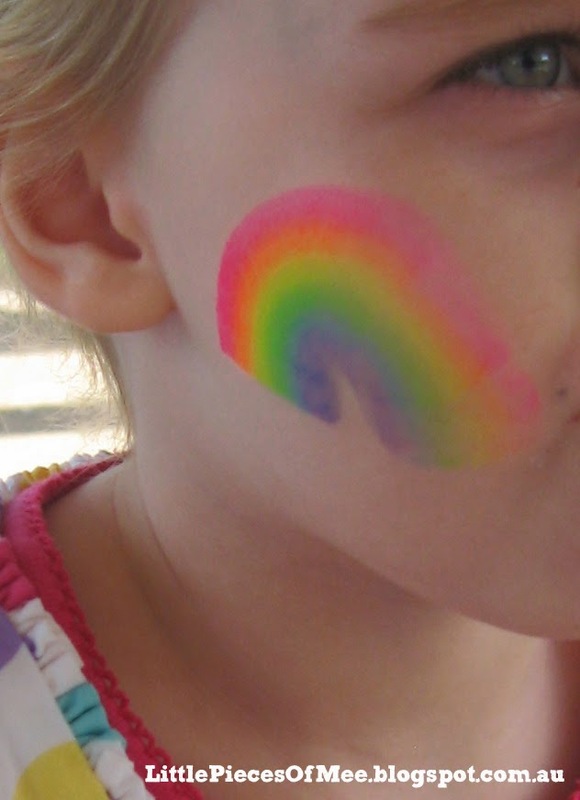 Don't you love it when you have one of those light bulb moments when everything just falls into place - I had one of those with the rainbow party idea. 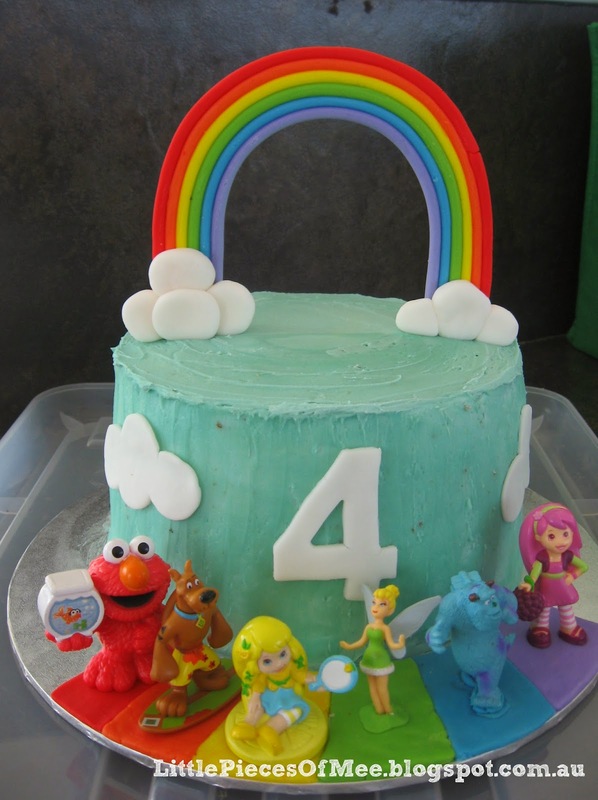 I took some of the characters that she likes and matched them to the colours of the rainbow and came up with Elmo for red, Scooby Doo for orange, Lemon Meringue (another of Strawberry Shortcake's friends) for yellow, Tinkerbell for green, Sully for blue, and Raspberry Torte for purple. 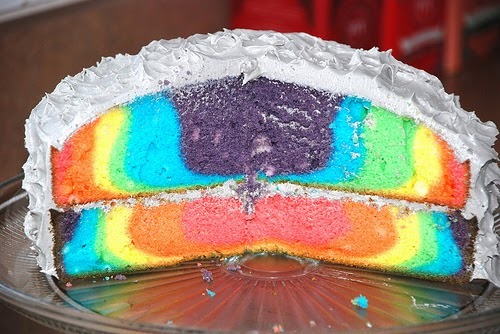 However when I took the cake out of the oven and cut it in half to see how it turned out, I was a bit disappointed - instead of a neat arch, the colours had swirled around the tin in a convection current. So I tried again, making the cake batter thicker with extra flour (almost a whole cup extra) before adding the colour. Again, it turned out with a convection current pattern, although slightly better than the first one. Again I was disappointed but being the day before the party, I didn't want to keep making cakes so I decided to use both the cakes, one on top of the other. My little girl didn't know what I was originally planning the inside of the cake to look like, so she didn't have any expectations of the cake. About a week before the party I made the fondant rainbow for the top of the cake. 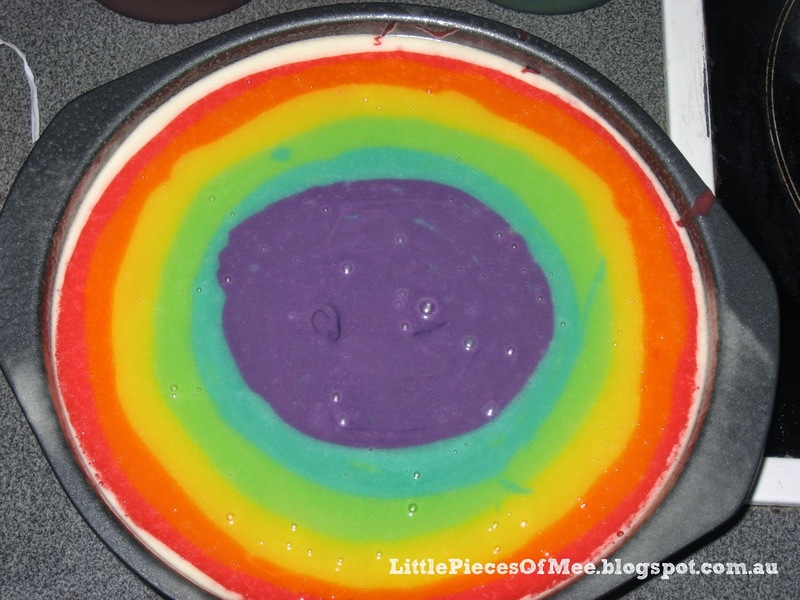 I found a great tutorial on CakesDecor.com on how to make the rainbow. 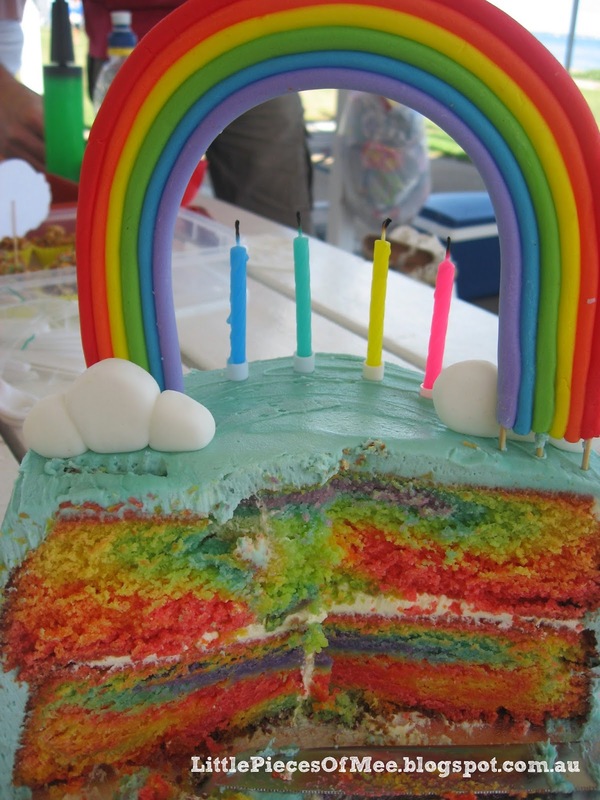 I followed it exactly, except that I made the rainbow much higher so that I could cut it down later to suit the height of the cake. I also made some clouds for the base of the rainbow using some white fondant which I hand rolled into separate flat balls and joined together using some edible glue made from tylose powder mixed with a bit of water. The clouds for the side of the cake were made with a snowman shaped cutter as I don't have a cloud shaped cutter - first I cut out the full snowman shape and then turned the cutter around to cut the 'head' shape into the larger end. I also cut a large number 4 out of some more white fondant, and then I made the rainbow coloured pieces of fondant to sit on the cake board to show the colours that each character represented. I used buttercream icing to cover the cake (tinted with light blue gel colouring) and then added the decorations. 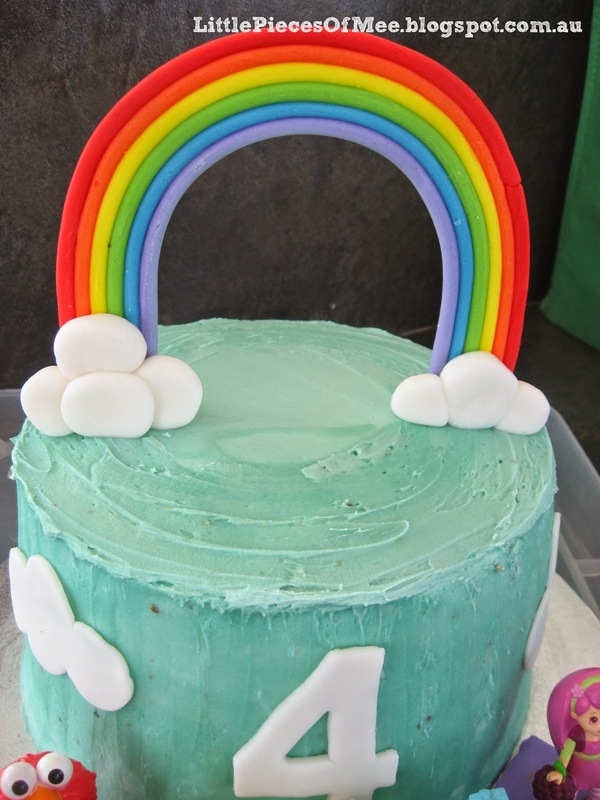 I was really happy with how it looked when it was finished, and I was glad I had left the rainbow with the longer 'feet' as I think it really needed the extra height with the double cake underneath it. 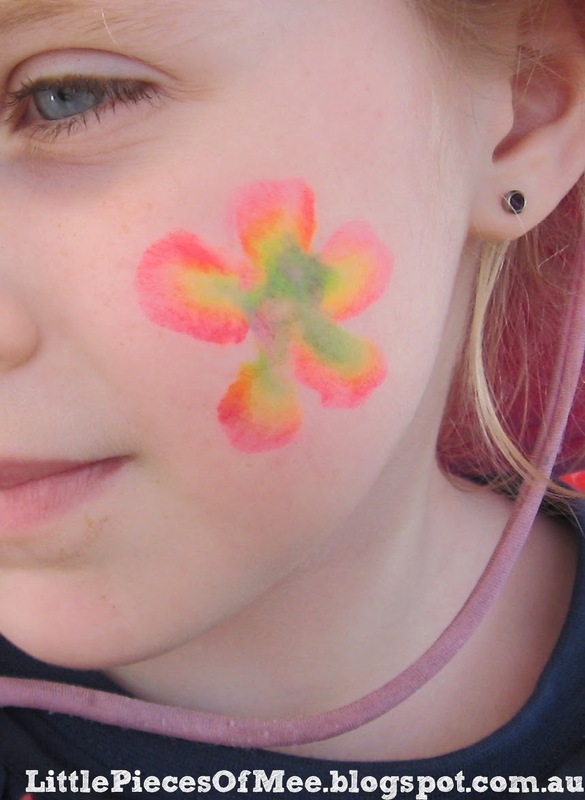 Not quite the rainbow pattern inside that I had planned on, but very colourful and my little birthday girl loved it. 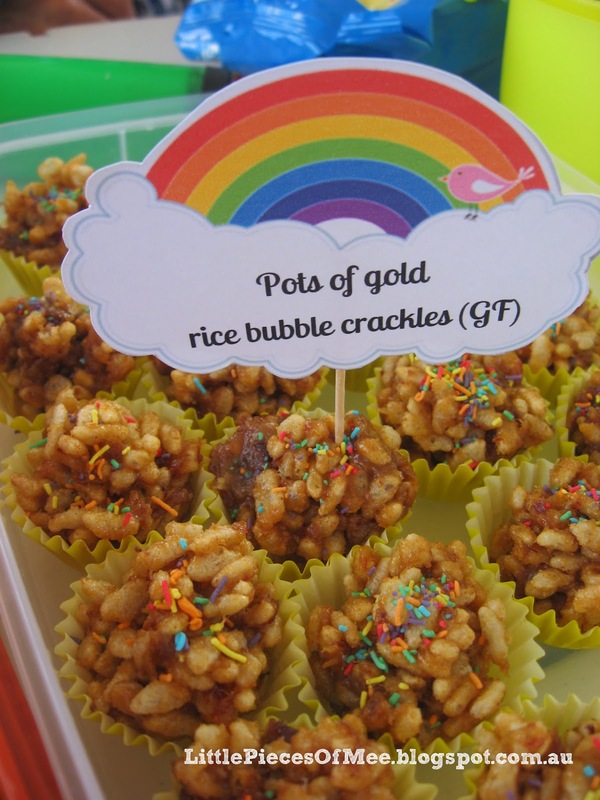 I also made some pots of gold from the end of the rainbow - these were rice bubble crackles in mini yellow cupcake cases with rainbow coloured sprinkles on top (see below for recipe). 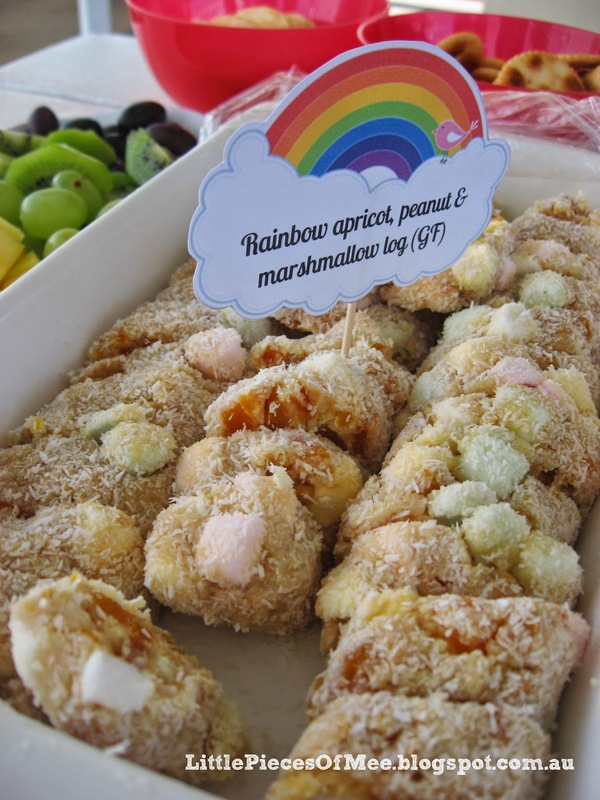 Mix all ingredients, except coconut, and form into two long rolls (use wet hands to stop it sticking). Roll in coconut. Chill and slice. Line mini muffin pan with mini cupcakes cases. 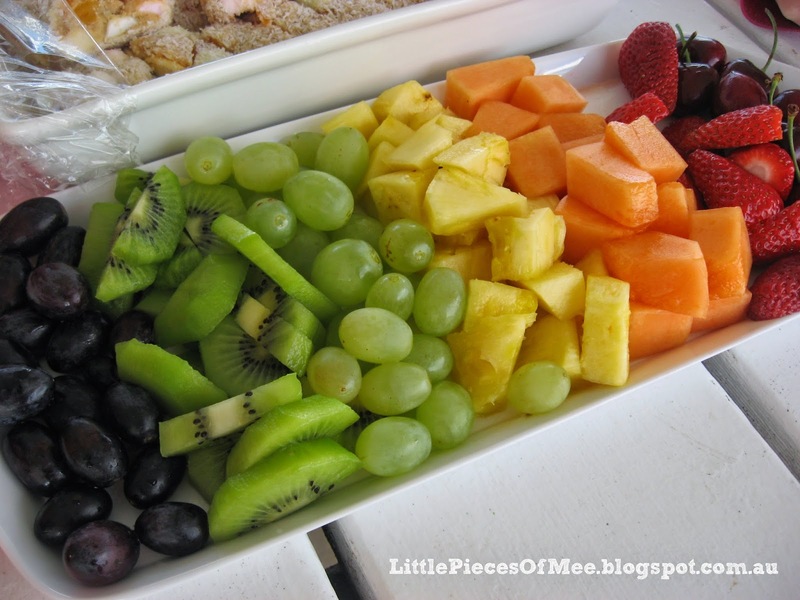 Put rice bubbles in a large mixing bowl and set aside. Melt butter in a saucepan over medium heat, then add caster sugar, condensed milk and dates. Stir for 10-12 minutes until dates are soft and fall apart. Remove pan from heat and add to rice bubbles. Stir until well combined. Use two teaspoons to spoon small mounds of rice bubble mixture into each cupcake case, using back of spoon to press the rice bubbles gently. 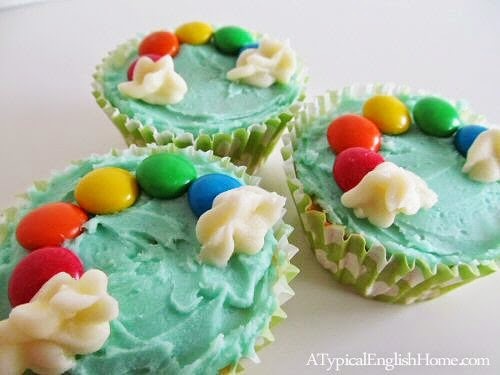 While mixture is still moist, add sprinkles to the top of each one and refrigerate to set.